We all love a good surprise, something one fifth-grader in Huntsville, Alabama, can certainly testify to after a special someone, who was dressed as the school’s mascot, ripped their costume’s head off to reveal who she was. Kale Lancey was standing with his peers on the Friday morning of Nov. 2, 2018, as part of a special class at Chaffee Elementary School that 16 former NASA engineers and scientists participated in. Unbeknownst to Kale, the eagle mascot standing before him was about to knock his socks off. His mother, Sgt. Desiree Lancey, had just returned home from a one-year deployment in Kuwait, where she taught a leadership course. 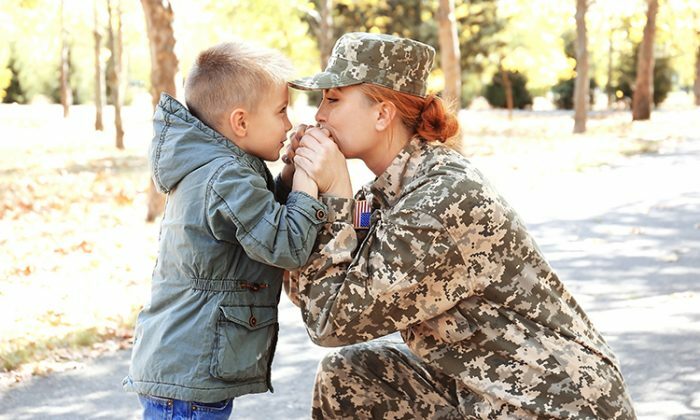 For military families, especially those with young children, being separated for long periods of time can be emotionally very challenging. Standing there with Kale clearly before her, Sgt. Lancey “just wanted to rip off that mascot head and go see my son,” she tells WAFF48. And rip that eagle head off she did. No sooner is Sgt. Mom’s head exposed does Kale’s jaw drop. He runs right up to mom, who braces for a terrific bear hug, yes—looking more bear than eagle without that head piece. “I missed you so much,” she tells him. Kale tries to stay composed at first, but he’s overflowing with happiness from the surprise. The tight embrace squeezes out his inner emotions, which he can’t contain anymore. It was a special homecoming, one that Kale’s teachers were all in on. And the good news was Sgt. Mom wasn’t going on deployment anymore. It was time for family now, and it was just in time for Thanksgiving too!